Elovera Imf Lotion is used for Itchy rash on the skin or mouth, Wounds, Radiation induced skin damage, Dry skin, Skin aging, Minor skin infections, Microbial infections of living surface, Acne vulgaris, etc. Provides a soothing benefit to dry, itchy, sensitive skin, leaving skin softer and smoother. Hydrating and rejuvenating the skin making it glowing and healthy. Elovera Imf Lotion is used for Itchy rash on the skin or mouth, Wounds, Radiation induced skin damage, Dry skin, Skin aging, Minor skin infections, Microbial infections of living surface, Acne vulgaris, etc. Elovera Imf Lotion contains: Allantoin Topical, Aloe Extract Topical, Hyaluronic Acid Topical, Sodium Gluconate Topical, Sodium Lactate Topical and Vitamin E Acetate Topical as active ingredients. 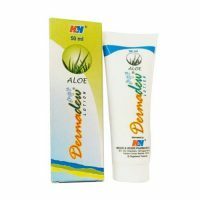 Elovera Imf Lotion works by possessing the wound healing and radiations induced skin damage properties due to acemannan component; contributing moisturizing action towards the skin; improving the skin integrity; decreasing appearance of acne wrinkle and erythema; possessing the antiseptic properties due to presence of six antiseptic agents named lupeol, salicylic acid, urea, nitrogen, cinnamic acid, phenols and sulphur; showing antibacterial activity; providing conditioning effects on the skin; producing the antiaging effect; treating the skin disorders; healing wounds and increases the re-establishments of the normal skin; possessing strong water binding potential; helping the skin to retain elasticity, turgor and moisture; improving the skin hydration status.